After a very busy week of full-throttle cataloging, this blog post must be concise. “But how?” I ask, knowing there are too many fascinating details to include. Many of her paintings scroll through my mind as I search for an answer. I try to match each with the landscapes we pass on our weekly treks to Ghost Ranch. But what about that green bush there? And that small crack over there? And why didn’t that tree make it into the painting? Miss O’Keeffe looked at these landscapes and made conscious choices about which portions to include. The artist did not render every detail, but instead only painted the parts she found important. Through this process, Georgia O’Keeffe captured the profound clarity we see in her artwork. This “spiritual grandeur” closely captures the grandeur of these vast, desert landscapes – not an easy feat. As many of us know, simplification, despite its name, is not simple. It is a continual conscious effort to truly decide what works and what does not. She also applied these decisions to the objects that entered her home and the dishes that lined her kitchen cabinets. I’ve been hearing a lot about decisions lately from the museum curator in gallery tours and talks. As I learn about the intentional selection of an essential set of works to tell a story in an exhibition, coupled with a fluidity to alter these choices once the art speaks on the wall, my eyes are opened to the methodical attention curators pay to each choice. Learning about these choices, and thinking about the choices Georgia O’Keeffe made both in her art and her lifestyle, makes me think that she was not only Georgia O’Keeffe, the artist, but also Georgia O’Keeffe, the curator. Relating one work to another, and to the works of other artists, creates a narrative of art that opens a dialogue about how ideas, visions, and visuals form throughout history. By seeing the whole picture, an artist can eliminate and pare-down to the true core of a subject. Miss O’Keeffe’s crisp simplicity reflects her continual practice to get to this core. Each item she placed in a painting, and each painting that went on a wall, was a choice. 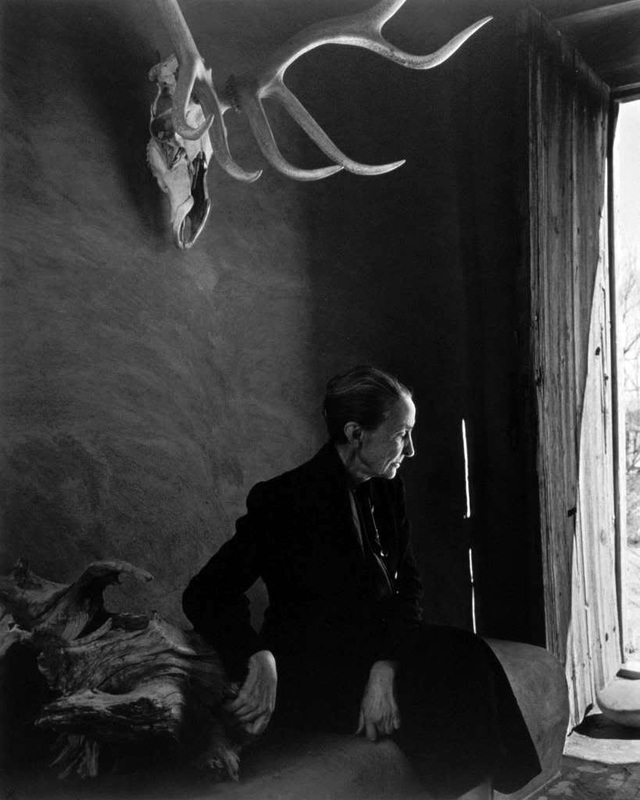 Through these many choices, Georgia O’Keeffe curated her art and life. But don’t we all? In a sense, we are all the artists and curators of our own lives. We make choices every day of what we take in and what we leave behind, realizing that what we choose to leave out is equally important as what we choose to leave in. After a while, these choices compile to create a person and a lifestyle. How do we find the essence Miss O’Keeffe so elegantly and effortlessly showed in her artwork? Choose the elements that illustrate our surroundings in a beautiful way. Perhaps this post wasn’t as concise as I originally intended, but simplification is a continual practice – one I will keep working on. Maybe with an O’Keeffe painting by my side. For a closer look at Georgia O’Keeffe’s artistic choices, attend this month’s “LOO’K Closer” talk! This Wednesday, July 29 at 12:30 PM in the Main Gallery. “Aesthetic.” Georgia O’Keeffe Museum. Georgia O’Keeffe Museum, 2011. Web. 20 July 2015. Moore, James. “So Clear Cut Where the Sun will Come . . . Georgia O’Keeffe’s ‘Gray Cross with Blue’.” Artspace. Summer 1986. Print. Stevens, Mark. “The Gift of Spiritual Intensity.” Newsweek. March 17, 1986. Print.